Summary: After being divided unofficially into two states during a 2002 civil war, nominally united under an unstable unity government from 2003-2010, and falling again into civil war last month, Ivory Coast is now again reunited as a single state. The change came about through a military campaign on the part of forces loyal to the newly elected president, who had not been allowed to take office after the election. U.N. materials by Wikimedia user Prioryman (source). Although the modern concept of a "country" implies that it should be a sovereign state under a single government, in actuality there are many gaps in this system - the official government of a country doesn't always have real control over the whole country. Until recently, the West African republic of Ivory Coast was one of these divided countries. 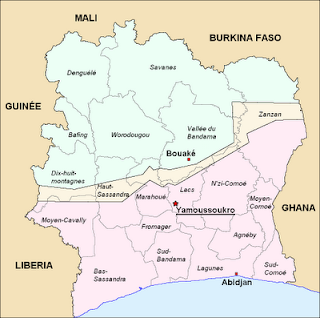 Also known by its French name, Côte d'Ivoire, Ivory Coast is a former French colony that became independent in 1960. The country is divided officially into 19 regions (similar to provinces), which are further subdivided into "departments", following the naming conventions used for local government in France. 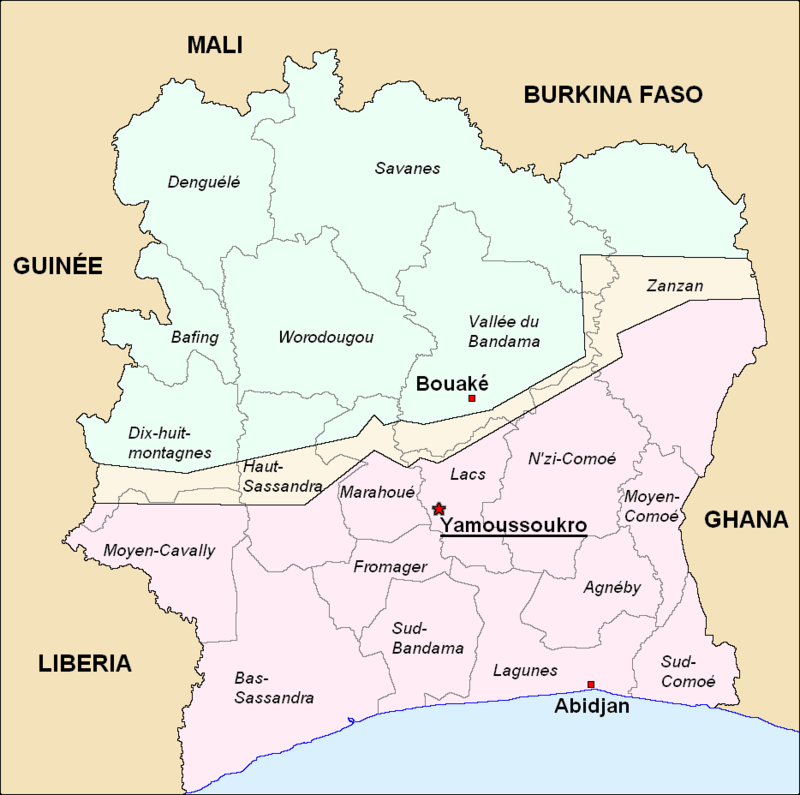 Officially, the capital city is Yamoussoukro, near the center of the country, but during the recent period of division, the largest city of Abidjan in the south has sometimes served as an unofficial capital for the established government, while the northern city of Bouaké has served as the unofficial capital of the rebel "New Forces". The country first became divided at the outbreak of the First Ivorian Civil War eight years ago. The government had effectively rigged the presidential election in 2000 by banning the opposition candidate at the last minute. The candidate, Alassane Ouattara, took his support largely from northerners, perceived as "foreigners" by the government and many southern Ivorians because of their alleged ancestry in neighboring Burkina Faso and Mali. 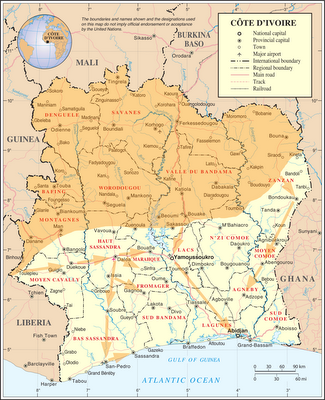 Already politically and ethnically divided, Ivory Coast split into two separate de facto states in September 2002, when a large number of soldiers defected from the government, quickly taking control of the northern half of the country. The civil war ground to a temporary halt after intervention by French troops stationed in the country, which was nominally reunited under a compromise agreement from 2003-2010. However, for much of this time the north and south remained under separate administrations, and there were regular outbreaks of violence during the first few years. In October 2010, nation-wide elections were held to choose the president of a reunited Ivory Coast. Alassane Ouattara was deemed official winner by the Electoral Commission, with the U.N. and other international bodies agreeing that the election was fair. However, outgoing president Laurent Gbagbo refused to accept the results, claiming that polls in the rebel-held north had been rigged. 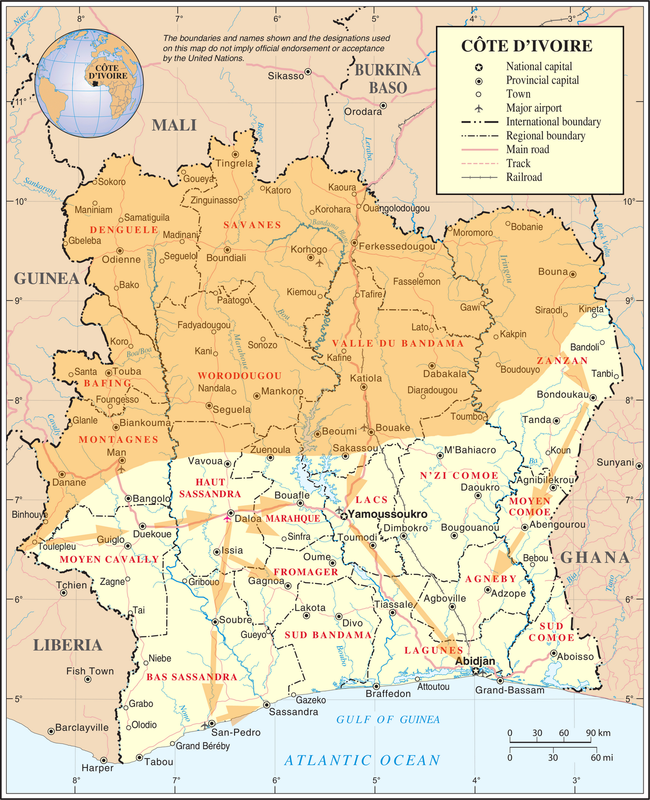 In late February of 2011, the rebel New Forces launched an offensive to take the southern half of the country and reunite it under president elect Ouattara. Over the course of the next month, they took control of most of the country in the name of democracy, though several brutal massacres of civilians occurred along the way. After a long standoff between the New Forces and Gbagbo's supporters in Abidjan, Gbagbo was finally arrested with the help of French and U.N. forces on April 11. Although today there are still pockets of fighting between rival militias, for the most part Ivory Coast is now a single state again under the government of president Alassane Ouattara.